Blow molders manufacture many different products, including toys, blow molded cases for transport and storage, sports equipment, garbage cans, planters, and most commonly, blow molded containers like plastic bottles for industries such as beverage, petrochemical and automotive. Blow molded plastics are all thermoplastic resins, and include high and low density polycarbonate, polypropylene, polyvinyl chloride, polystyrene, polyamide and acetal. The purpose of blow molding is to form a uniform finished plastic product that is smooth, airtight and does not need to be joined together in any way. While injection molding and rotational molding are more precise methods of plastic molding, blow molding offers the advantage of high-volume capacity, efficiency and relatively low costs. 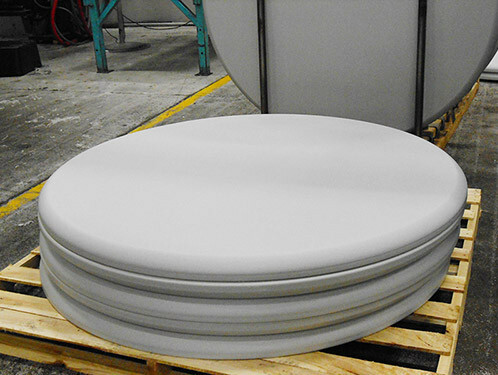 Blow molded products can be formed from standard and common die-cast cavities, but custom blow molding can be used to create specific products for unusual and unique purposes. It is the most well-suited method for forming hollow plastic parts and thousands of applications benefit from the versatility of the process combined with the strength and durability of the products. Injection blow molding, extrusion blow molding, and stretch blow molding are the three most common types of blow molding which differ during the pre-form stages. 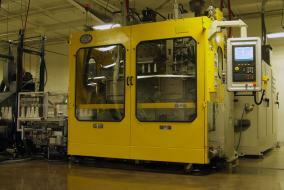 Each variation has specific advantages and application uses, yet the basic process of blowmolding is straightforward. The plastic is melted down and formed into a parison which is clamped into a mold, a blow pin is then used to force compressed air into the parison and the molten plastic expands to fit the shape of the cavity. Controlled and constant air flow is essential to the quality of the final outcome as varying wall thicknesses compromise the strength and durability of the product. Blow molders have to ensure the constant expansion of the plastic in the mold to achieve uniform wall thickness in the product. The cavity is cooled, usually by conduction, and the hardened plastic product is removed from the mold, sometimes with the assistance of ejector pins. The process usually takes a matter of seconds and therefore blow molding machines can produce high-volumes of durable plastic products in short periods of time with minimal finishing requirements. Blow Moulding Blow moulding, more commonly known in the US as blow molding, is the process of using compressed air and molten plastic to create hollow, thin-walled containers. Blow molded products take their shape according to the form of the mold cavity that the molten plastic is forced into.